Ministry of Propaganda - 14/Oct/2006: "Saturday Downlands Walk"
No, this wasn't today, this was last weekend. Apart from a bit of hazy sunshine late this afternoon today was fairly grey and miserable. 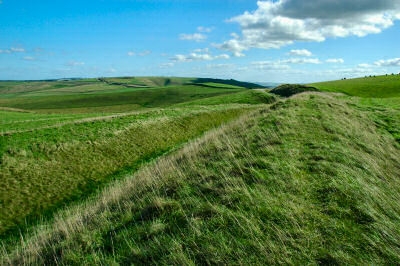 I had already hinted it yesterday, last Saturday I went on a downlands walk near Silbury Hill and Beckhampton. 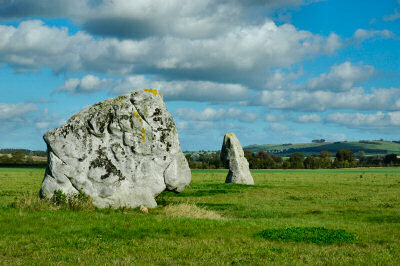 The walk started in Avebury but only skirted the famous stone circle. As I have seen it several times already (most recently in June) I didn't make the detour for the circle but walked straight on to Trusloe. There's not much to see in Trusloe (at least I didn't see anything exciting), but something more interesting not far from it on the way to Beckhampton: Two standing stones in a field. I don't know any background about them and if there is any link to Avebury, but found it interesting to see them so close to Avebury. Passing through Beckhampton (some nice old cottages there) the walk continued past Beckhampton Plantation to the Wansdyke at Allington Down. Quite wide views from here, I could also see Cherhill, where I had a walked the previous week. On reaching the Wansdyke I had my lunch and a short look around, before starting the return leg. The return leg took me to West Kennett, past West Kennett Long Barrow and Silbury Hill back to Avebury. May be not the most exciting walk, but still a nice opportunity to stretch my legs and get some exercise. Probably would have been much nicer if there hadn't been a fierce fairly cold wind blowing over the exposed downlands. But at least it was quite bright and sunny for most of the walk.